Small but Mighty Sharks: Size Isn’t Everything! When it comes to sharks, everyone is fascinated by the size and power of these sea predators, and the little guys are sadly forgotten. Bigger doesn’t necessarily mean better, and these species prove that small sharks are just as fascinating as their larger relatives. Named for its colouration, which makes its skin look like a sky full of stars, the starry smooth hound can be found in shallow waters, favouring sandy areas where it can blend in with its surroundings. Although they look like fierce predators, their teeth tell a very different story. Rather than having sets of sharp teeth (like other shark species), starry smooth hounds are equipped with blunt crushing plate teeth that are powerful enough to break the shells of crustaceans – their main food source. Often confused with its starry cousin, the common smooth hound is a slender shark that shares the grey-to-grey-brown colouring of the starry smooth hound, but lacks the distinguishing white spots. They also have blunt crushing plate teeth, which is why they’re sometimes referred to as gummy sharks. Only growing up to 3ft in length, the lesser-spotted catshark is also known as the rockfish and the lesser-spotted dogfish. It’s harmless to humans, and is one of the most popular shark species in the North Sea. Their egg cases – known as mermaids’ purses – can often be found washed up on the beach, but don’t worry: they’re nearly always empty! You can see a small tear where the shark pup left the sack, so keep an eye out for this fascinating find next time you’re at the beach. Named for the distinctive black tips of their fins, you can find this species along coral reefs in the Indian and Pacific oceans. Because of its size, the blacktip reef shark tends to shy away from other predators and is often found in large groups, for collective protection. Blacktips are a viviparous shark species – birthing live pups instead of laying eggs – with litters usually consisting of between two and four pups, although litters as large as 10 pups have been documented. Another shark species known by many names, the nurse hound is often found in British waters, but has been spotted as far as the northern coast of the African continent! Preferring to feed at night, nurse hounds will spend the day hiding away in nooks and crevices in rock formations, or lying ‘asleep’ on the seabed. Like lesser-spotted catsharks, nurse hounds also reproduce using mermaids’ purses. 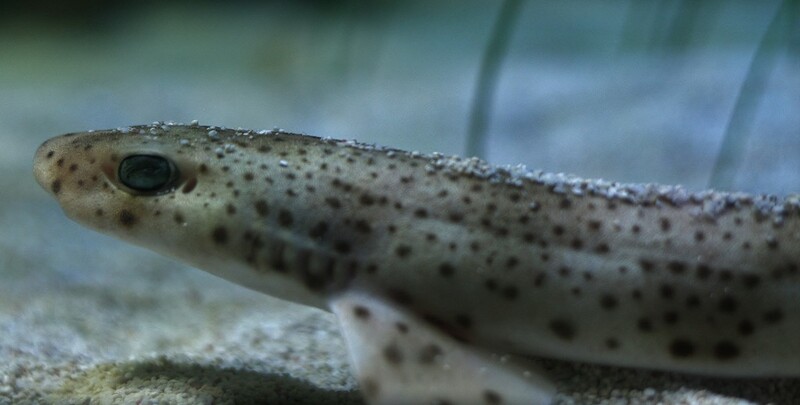 Growing up to an average length of 5ft, the California leopard shark is the largest of the small species (our resident leopard shark Georgie is the biggest shark in the aquarium) and, as the name implies, is native to the California coast, but can be found all the way from Oregon to Mexico. Like the larger shark species, they have rows of sharp teeth rather than blunt crushing plates. This is because they feed on octopuses and fish in addition to crustaceans. Found in the shallow coastal waters and coral reefs of Australia, the epaulette shark is a unique species thanks to its ability to walk – something no other shark, big or small, can boast about. Because of its natural habitat, the epaulette shark has evolved to survive the regular ebb and flow of the tide present in intertidal zones. When the tide is low, they use their fins as legs to crawl between rockpools, looking for prey. At this point, you might be wondering how they survive out of the water, because sea creatures can’t usually breathe on dry land. Epaulette sharks have a clever solution to this problem too – they can hold their breath 60 times longer than humans. Popular as a pet due to its size and its docile nature, the bamboo shark can be found in tropical climates – from the east coast of the Indian Peninsula, all the way to northern Australia and Japan. Like most small sharks, they prefer shallow coastal waters, and are often found in tidepools or living around coral reefs. They’re nocturnal creatures, so they can seem a bit shy during the day, but you can find our very own bamboo shark – Boo – happily swimming around in the aquarium. Take a look here for the list of sharks we house here at Bristol Aquarium! To find out more about the small but mighty sharks and to see a selection of these in action, book your tickets online and save 10% at Bristol Aquarium.